The Elegance Latex foam mattress is 32cms deep and includes two layers of foam above 2000 individual pocket springs. There is a 25mm layer of natural latex foam on top of a 25mm layer of reflex foam. The pressure-sensitive foam gently cradles you in an optimum sleep position relative to your personal weight and shape, and in turn helps to relieve pressure points across your body. Memory foam responds to your weight and temperature, and moulds to your natural shape, gently cradling your body and helping to reduce the amount you toss and turn promoting a more restful sleep. Latex moulds well to your body contours and is cooler than memory foam and is naturaly antibacterial and is therefore very suitable for allergy sufferers. It is sourced from rubber trees. 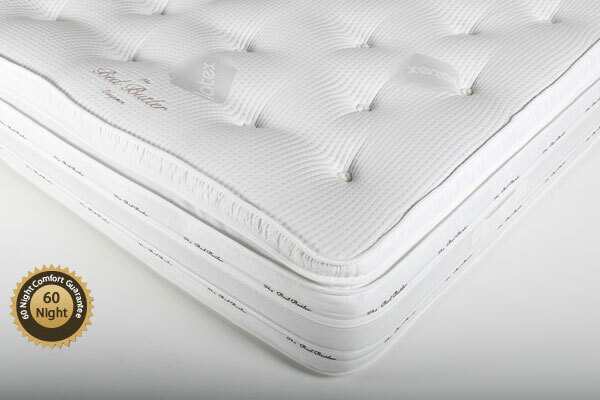 The Elegance latex foam mattress also includes 2000 individual pocket springs. Each spring is encapsulated in fabric and reacts individually to each part of your body. This ensures that any movement on one side of the bed will not disturb a person on the other side of the bed. It will also prevent any roll together.It has a 3D breathable Branded border helping to keep you warm in the winter and cool in the summer. There is no need to turn this mattress, but rotation is recommended. The Elegance Latex foam mattress lives up to its name of being a most elegant and luxurious mattress. Latex is naturaly antibacterial and is therefore very suitable for allergy sufferers. The mattress prevents any roll together.